Growing: Easy Jacky White of Paradise Seeds is a mostly sativa type of marijuana that is fast to flower and can produce abundant yield during harvest. 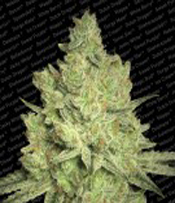 It is composed of 75% sativa and only 25% indica traits. This strain branches out during vegetative and flowering stages so growing Jacky White marijuana plants indoors will require an adequate space for optimum growth. Inadequate indoor room space may stunt the growth of Jacky White weed plants and thus, amount of yield is lessened. Growing Jacky White indoors will give a grower generous yield when plants are grown under excellent artificial lights. Yield can also be increased by pruning or bending Jacky White plants. All throughout the flowering time of Jacky White, it gives off its distinct grapefruit-like aroma. The THC level is high, ranging from 15 to 18%. It can easily be cultivated in soil but more advanced methods may be required for growing in hydroponics.